Jin’rokh the Breaker is the first boss encounter in the new 5.2 raid instance. He is a one phase fight, with simple mechanics, and a clear soft enrage. Essentially the fight comes down to individual awareness, and utilizing raid mechanics to boost DPS and Heals in order to defeat the encounter before his soft enrage. Let’s quickly run through some of his simple, cookie-cutter, abilities. First, there is a tank debuff that requires taunt offs. Jin’rokh will periodically cast Static Burst which will do moderate raid damage and apply a debuff to his current target. The debuff, Static Wound, starts at 10 stacks. Each time the tank with the debuff is melee’d, the tank takes 20k Nature Damage per stack, plus 1/3 of that damage is done to the entire raid. Due to this, we advise that you bring tanks which have good mitigation which completely avoids melee attacks. Classes than can consistently dodge, thus avoiding raid damage, excel at this encounter. The second tank mechanic is Thundering Throw. Thundering Throw will take the current tank and throw him to one of the four statues located in the four corners of the room. This inflicts a large amount of damage to the tank, and stuns and damages any raiders who are hit by the tank when he lands (So do not be standing below “un-broken statues”). The throw causes the statues to break, and start creating a pool on the ground (looks exactly like defile) called Conductive Water. When standing in the Conductive Water, you will take 80% more Nature damage, however you will deal 40% more damage and receive 50% more healing. So, once a pool is spawned, all RDPS and Healers should stack tightly together in the pool. The pool grows in size over time, until it takes up roughly 1/4 of the room. Once large enough for melee to stand in the pool, it is advised they also take advantage of the damage buff (his hit box is stupid large). Now comes the main mechanic of the entire fight. Periodically, Jin’rokh will spawn an orb of lightning that will fixate on a random ranged player. This orb gains movement speed for every second it is alive, so eventually it will hit the fixated player. When the orb collides with the player it is fixated on, it explodes and deals about 200k damage to the player (and anyone within 5 yards). The main thing to look out for is, if it collides with the fixated players inside the conductive water, it will basically kill everyone in the pool. Also, when the orb detonates, it creates a little Lightning Fissure on the ground which will deal damage to anyone near it. In addition, if another orb is kited through a fissure, it will explode and kill the raid. Finally, Jin’rokh will periodically cast Lightning Storm which will deal very high raid damage to everyone. Of course, this is nature damage, so if you are in one of the pools during this cast, it will one shot you. After lightning storm is done channeling, he will electrify the Conductive Water, making it unusable (basically, if you stand in an electrified pool you die). So, when lightning storm begins to be channeled, everyone stacks tight under the boss, and you pop your raid healing CDs here. After it is over, everyone spreads back out and waits for the next pool to spawn. The strategy for this encounter is really simple, and can be summed up in a quick paragraph. When the fight starts, everyone spread around the room, but do not be below any statues (or you might get stunned). When the first pool spawns, all RDPS and Healers, stack in it. When an orb spawns and fixates on one of those players, they need to move out of the pool and collide with the orb in one of the grates along the outside of the room (where the pools never go). Subsequent orb kiters need to make sure not to kite through the fissures spawned by previous orbs. Finally, when he starts to cast lightning storm, stack under him and pop raid CDs. Rinse repeat. From what I saw during my brief testing period on the PTR, the damage in this fight is extremely low (if everyone does the mechanics correctly) during the periods in between lightning storms. Just keep heals up on the tank, and throw down some AoE heals if the tank gets melee’d with a large amount of debuff stacks. If you are a class that can heal through DPS (ie. Monks and Priests), you probably should during this period. There is low-moderate damage, and the enrage might be tight for some groups. In addition, there is a 40% damage and healing amp on this fight, so Fistweave/Atonement healing will be stupid good. When he channels lightning storm, just make sure you and the other healers have set up a CD rotation. There will be 4 storms total this fight, and after the fourth there is the soft enrage (so really just 3). So in 10m, assign one healer to blow his/her CDs each storm, in 25m have two each. Overall, a really nice first encounter to the new raid. Easy to understand mechanics, however they will provide a slight “idiot check” to people who cannot keep orbs outside of pools. 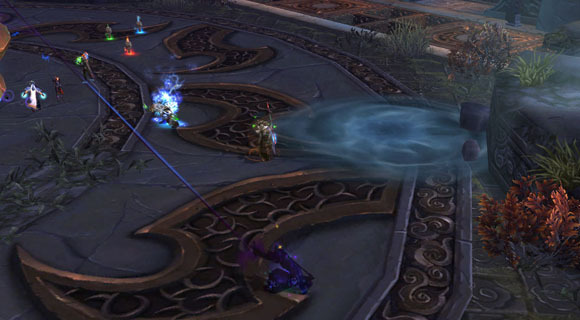 Hopefully your raid can avoid wiping to poorly placed orbs, and down this encounter with ease! If you have any comment, questions, concerns, and corrections please post a comment below, and Happy Healing!